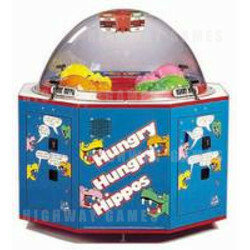 Hungry Hungry Hippo is a super cute 1 to 4 player children's novelty redemption game in which players manipulate a handle back and forth to actuate the hippos movement to eat balls. The balls are circulated through the game by a blower motor. The hippos heads open and close, pulling the balls to a return hole. The player with the most balls eaten at the end of a programmable time period wins and all players receive tickets based on their score.